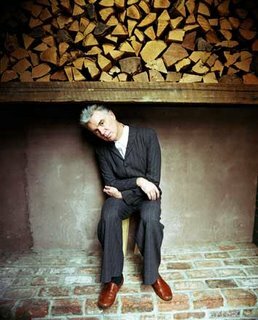 Since the demise of Talking Heads in the late 80s, David Byrne has diversified his creative interests in a way few pop stars are able to do. Apart from maintaining a successful career as a solo musician, Byrne has been involved in film, photography and design; he has written a number of books, and worked on a host of musical collaborations. At the 2006 Adelaide Festival of Arts, we are lucky enough to have seen two of Byrne’s recent projects, a presentation on the Powerpoint software application, and the world premiere of Here Lies Love, a ‘song cycle’ about the life of Imelda Marcos, co-ruler of the Philippines in the 70s and 80s. Here Lies Love takes the form of a series of fairly traditional pop songs (verse-chorus-verse) played in a variety of styles (disco, rock, funk, latin, ballad) by Byrne and a small group of colleagues. Augmenting the core of guitar, bass and drums, is a percussionist and a keyboard player. The vocals are shared by Dana Diaz-Tutaan (Imelda), Ganda Suthivarakom (Estrella), and Byrne, who represents the ‘voice’ of other key players in Imelda’s life. The stage itself is unadorned, although behind the band a small screen plays news clips and home movies of Imelda’s life. The narrative of the ‘song cycle’ follows a familiar ‘rags-to-riches’ formula, starting with Imelda’s beginnings as a small town beauty queen, and ending with the fall of the Marcos regime in 1986. Along the way we meet the faithful servant Estrella, former beau Benigno Aquino and, of course Ferdinand Marcos. Between songs, Byrne provides additional insights and snippets of information. Unfortunately, this commentary sometimes lessens the impact of the songs themselves, as the lyrics repeat what we have just been told. As already mentioned, the songs themselves are simple pop tunes, leaning heavily on the disco and dance genres, and could fit neatly onto any number of Byrne’s solo albums. They are tuneful enough, and skillfully played, but I wonder about the connection of the music to Imelda’s life. Would it have been possible to blend some traditional Filipino sounds and flavours into the music of Here Lies Love (although, admittedly, Imelda was a fan of Western dance music)? I attended the premiere performance of Here Lies Love, and it might have just been first night ‘jitters’, but there seemed to be overly long pauses between songs while the band fumbled around with cables and instruments. David Byrne even seemed a little unsure of himself during his song introductions, tripping over words and pronunciations. The already restless crowd filled these delays with the sort of noise more often associated with a rock concert than a theatre performance. The layout of the venue didn’t help matters, as two bars selling alcohol and soft drinks flanked the ‘general admission’ area. This meant that steady queues of people were constantly moving around in front of the stage, causing further noise and distraction. While the concept of Here Lies Love is highly original, the production itself, for a variety of reasons, struggles to transcend the rock concert formula. Maybe I was expecting something more? Nevertheless, there is enough going on to make the performance consistently interesting and informative. I certainly feel as though I know more than I need to know about Imelda Marcos. And, by the way, there was no mention of the shoes. P.S. For some insights into his Adelaide experience check out David Byrne’s online journal. I went on Thursday night to see this show also and I also wondered why there was no mention of shoes. That’s all I really knew about Imelda Marcos going into the show. There was mention of Studio 54 so why not the shoes?